Subhash Chandran, a lawyer practicing in Delhi has approached the Supreme Court today seeking an independent instigation in Patiala House Court and JNU incidents by a Special Investigation Team [SIT]. Senior Advocate C.U.Singh mentioned the Petition Today and it is posted for hearing tomorrow along with Kanhaiya Kumar’s Bail Application. “the Petitioner seeking redress as one of the many innocent victims of a shocking assault and use of criminal force carried out on 15.02.2016 by criminal elements, including advocates, within the premises of the Patiala House Court complex, located barely 1.3 km from this Hon’ble Court. On 15.2.2016, thePetitioner and other innocent lawyers, journalists and students from the Jawaharlal Nehru University were attacked and their cellular phones smashed to pieces by these criminal elements in a clearly premeditated manner in an attempt to commit violence on Mr. Kanhaiya Kumar who was being produced before the Magistrate on charges of sedition. a) Whether the officers of Delhi Police who was very much involved in the attack which took place on the students of JNU and the teachers and the journalists at the Patiala House court complex can be relied upon for a fair and unbiased investigation? c)Whether an independent investigation by a special investigation team is necessary to unearth the truth in this case and find out the truthfulness behind the allegations made against the students of JNU? d)Whether a transparent and unbiased investigation is possible against the student organisation of the ruling party government wherein serious allegations and documentary evidences are available? 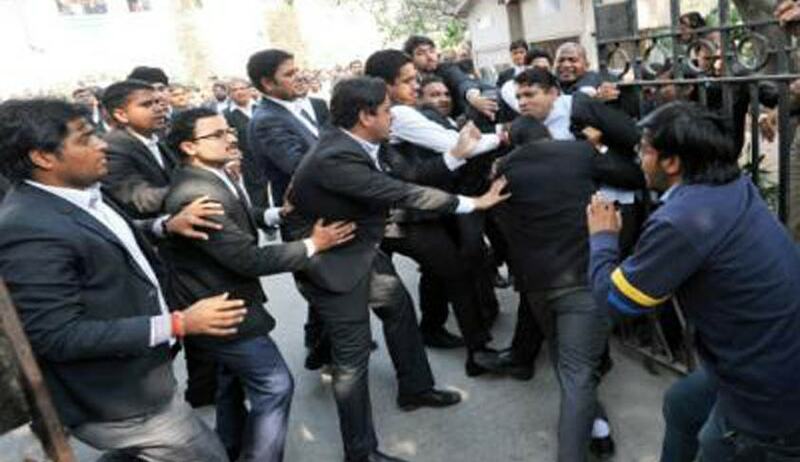 It is also stated that, on the same day the petitioner along with other complainants approached the police to file complaint against the people who were clearly indulged in the criminal activity inside the Patiala House court complex they were met with cold shoulders and were made to wait inside the police station. Even after hours of waiting their complaints was not registered. He also lodged a complaint through Email reiterating the same incident on 16.02.2016.
f) Issue a writ of mandamus or any other writ or direction to the Respondent No.3 to personally present before this Hon’ble court and explain as to why the direction of this Hon’ble court has not been complied with.